The second of two Flamsteed workshop in the space of a fortnight returned to our favourite topic of telescopes. 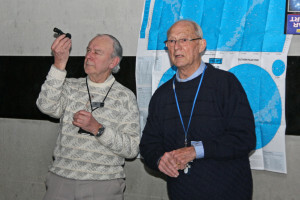 David and Roger, assisted by Martin and myself, presented a 2-hour workshop on the different types of telescopes and mounts, giving some general advice to those who were either thinking of buying a telescope or needed help with a recent purchase. 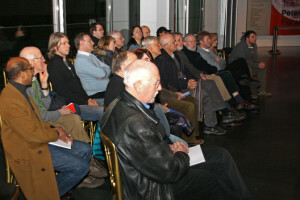 Once again, Flamsteed members turned out in force, completely filling the 40 seats that we had available. Sadly, the weather didn’t cooperate (how many times have I written that this year? ), so we were unable to set up the telescopes outside. As so often happens, though looking through the telescopes is always a treat, everyone who attended seemed to be just as happy chatting about the telescopes indoors! David started with a description of the different types of telescope, from refractors to reflectors, covering Newtonian designs and catadioptric systems, looking at the advantages and disadvantages of each. An explanation of aperture, focal lengths and focal ratios followed. Martin has produced a excellent guide to all of this terminology, which can be found on the Flamsteed website here. The key point is that the larger the aperture of the telescope, the larger the light gathering power, meaning that fainter objects are visible. Reflectors offer the most amount of aperture for your money, but do require regular collimation and have less contrast than refractors. Larger aperture refractors can be expensive, particularly those that have been corrected to avoid the colour fringing inherent in the use of lenses, but they do offer better contrast and require less maintenance. The different types of mounts were then discussed. Alt-azimuth mounts are generally the cheapest and easiest to set up. However, it’s much harder to keep objects in the field of view, unless you are using computer control, and cheaper mounts tend to be very flimsy and prone to vibration. Many amateurs choose to use a variant of the ‘alt-az’ mount, known as a ‘Dobsonian‘ or ‘Dob’. This type of mount is very robust, though can be quite bulky to move around. My own 12-inch Dobsonian telescope is a particular favourite for bringing to public events, but I didn’t bring it to the workshop as it’s a little too bulky to be lugging up and down stairs. Instead, I brought along a very portable 100mm APO refractor on an equatorial mount. Portability of your scope is a very important consideration, unless you are looking at a permanent installation in a home observatory. Take note of the weight of telescopes and mounts and ask yourself the question whether you are able to transport and set-up your scope easily. Equatorial mounts have a huge advantage over alt-az mounts, in that they only have to be moved in one axis to track an object… providing you’ve set up the scope correctly! Much discussion was had on how to correctly ‘polar align‘ these mounts and telescopes. My own view is that a rough alignment, visually aligning the scope towards Polaris, is usually sufficient if you are just using your telescope for visual observing. Astrophotography, however, requires a much more accurate alignment. Finally, in our discussion on mounts, we looked at ‘go-to‘ systems. This type of ‘computer-controlled’ mount has become increasingly popular over the years, becoming progressively cheaper. Once these mounts are set up, they are very easy to use, but it’s often tricky to set them up as they require alignment on 2 or 3 stars to track accurately. Some of the newest ‘go-to’ systems even perform this alignment step automatically, but these systems are very expensive. Martin then presented a very useful section on finding objects in the night sky. Martin learnt his way around the night sky by looking at a different constellation every night, starting with the Plough and working around from there. Martin’s guide to finding objects in the sky can be found on the Flamsteed website here. The formal workshop presentations being completed, we then had a very informal session where Flamsteed members looked around the various telescopes on display and asked questions. This was a very lively session, with lots of great questions being asked. We just about managed to finish by our 9pm deadline but, in truth, we could probably have gone on for another hour! Not wishing to be locked into the Royal Observatory however, we decided to call it a night. A very enjoyable evening, which we hope to repeat soon. Martin shows a picture of his garden shed… but this is no ordinary shed! It’s an observatory! Mike shows off his new telescope!